Round four of the EKZ Cross Tour is done. 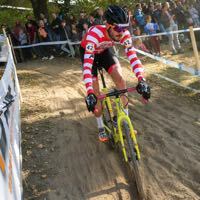 The riders and spectators have been waiting for a long time to see a cyclocross race like this one was. Skills in all kind of ways were demanded. 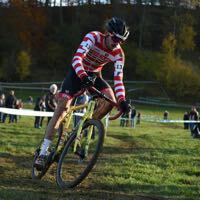 It was oldschool and the same course as in 1995, when we „Swissies“ got the last worldchampionchips in cyclocross. 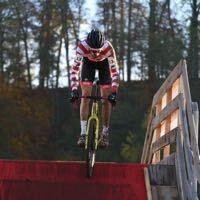 Again the race pulled a lot of international riders to Eschenbach. Almost 60 elite men were signed in for the event. Names like Mourey, Vanthourenhout, Bertolini, Chainel, Aernouts, Zahner and Wildhaber made the race to a mini-worldcup. To be in the top ten before the first downhill was necessary, not to get in any trouble in the big pack. The off-camber section was the key part of the race. The decent from the highest point of the race was around 200m long, steep and very slippery. It was even hard to get down by feet. My start was pretty good, I could keep up with the top fifteen for the first couple of laps. Riding in tenth position i made a self-inflicted mistake, crashed, my derailleur hit the ground and bent to the middle. Not realizing it while hitting the big gears, I had no problems. As I wanted to shift to the lower gears the derailleur hit couple of my rear wheel spokes, they broke and I couldn’t ride anymore. So unfortunately I had to run almost a whole lap to change the bike. To fall back many spots on a such big race and nice position was endless disappointing. I finished on 17th place. My performance was pretty good, I can fell the power in my body and I’m looking forward to the Worldcup race in Namur BEL next Sunday. Veröffentlicht am 15. Dezember 2015, in Allgemein. Setze ein Lesezeichen auf den Permalink. Hinterlasse einen Kommentar.